We are recording all styles of music including rock, blues, jazz, indie, country, and acoustic, as well as oral history and children's music. 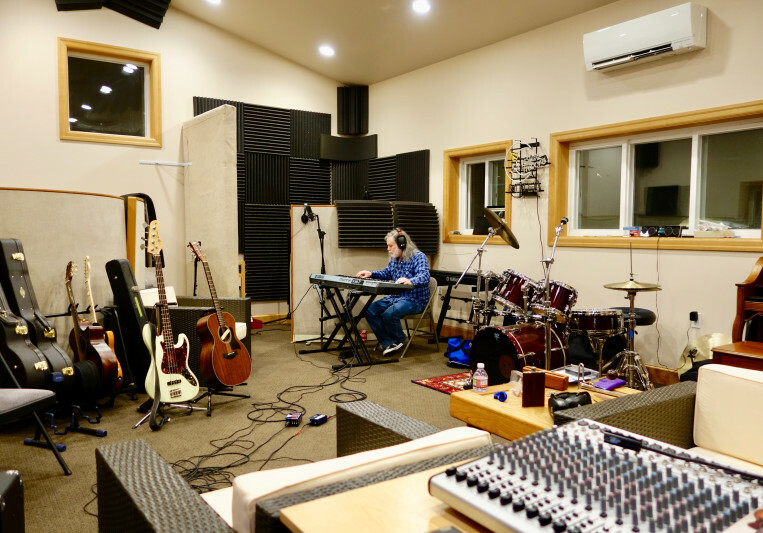 Our studio comprises 600 sq ft of space, designed with acoustically treated areas to capture vocals and instruments clearly. Corrections for absorption, diffusion and equipment placement are done. Specialized analog and digital gear is used in the studio to capture your sound and to create excellent balance and clarity for each song. To ensure the highest quality in digital performance, routing and stability, we use cutting edge tools such as the Apollo 16 Thunderbolt audio interface technology with both Universal Audio and Pro Tools digital software. This system, coupled to outstanding Neumann KH310 studio monitors provides the ability to capture details in your sound as well as accuracy and dynamic clarity during the mixing process. Our studio engineer is an experienced drummer and vocalist with several years of audio engineering experience. She has also managed a variety of musical groups and understands the needs of recording artists. Record and mix one or more songs/day with two mixing revisions. Turn-around time for Demos is one or two days and fine mixing is one to three days, depending upon number of tracks and songs.